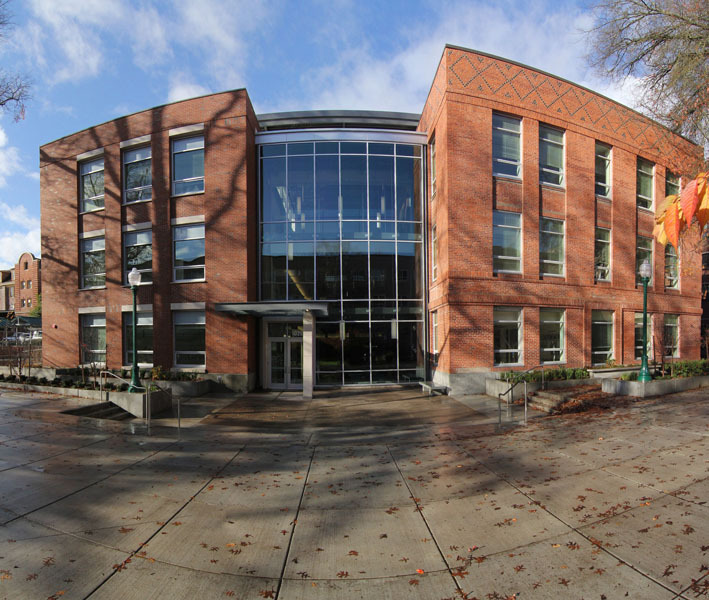 Allen Hall, whose earliest wing has been a part of the University of Oregon campus for 91 years, will be a spanking new place for faculty, staff and students of the School of Journalism and Communication who return to the building for winter term. There may be concepts scribbled on whiteboards or ideas projected on large flat screens. Students may huddle around tables, arguing the best answer to a challenge and pinning each new solution to the wall. Taking its cue from modern newsrooms or public relations agencies, SOJC's 18-month, $15 million, three-story redesign of Allen Hall has put collaborative learning and innovation at the heart of things. Returning students will find an additional 18,000 square feet of space that combines traditional classrooms with labs and informal learning areas. Ample outlets and fast Internet connections make it easy to plug in and log on. Students can write and project images on walls that are also magnetic. The third-floor Digital Commons, a flexible space that can accommodate a large class or several smaller groups, exemplifies the new building’s open studio environment for teaching, collaboration and production. Private gifts, including a $5 million anonymous lead gift and more than 80 contributions ranging from $10 to $300,000, covered half the costs of the $15 million renovation. State general obligation bonds authorized by the 2009 Oregon Legislature funded the rest. “We are grateful to the donors who made this possible, to the legislators who supported this project and to the State of Oregon for the matching bond,” said Tim Gleason, the Edwin L. Artzt dean of the School of Journalism and Communication. “The new Allen Hall will inspire our faculty and students to do great work and give them the tools they need to do it. The renovation unites Allen Hall’s 1922 and 1954 wings, preserving the building’s past while creating a modern, cohesive building. In 1954, when the last major addition was completed, the building served 300 majors. Today, it serves more than 2,000. The newest renovation project has been affectionately dubbed "Allen Hall 3.0," recognizing the building's two previous iterations. Building highlights include a digital gallery for showcasing student work, new and renovated classrooms, a hearth area and a signature lecture space. “We’re delighted to open the doors to a world-class facility that matches the caliber of our School of Journalism and Communication,” said UO President Michael Gottfredson. The building’s sustainable design is equivalent to LEED silver, and despite a 40 percent increase in space, the building’s energy use is net neutral and 26 percent more efficient than required by Oregon’s energy code. Designers anticipated changes in technology and student needs, making the building adaptable for the future. Eugene’s TBG Architects + Planners was the architect of record. YGH Architecture of Portland was the design architect. Lease Crutcher Lewis was the contractor, and 99.6 percent of the contracts were granted to Oregon companies. The university broke ground in June 2011. During the construction, Agate Hall housed the School of Journalism and Communication. The school will open its doors to the general public at 1 p.m. grand opening on March 1.